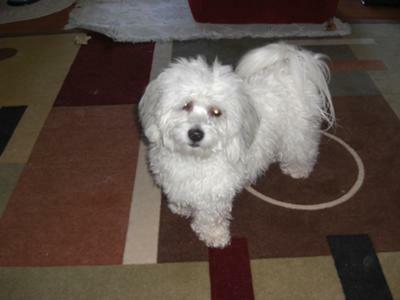 I have written much about Tuffy here at our Coton de Tulear website. Today I read one story about a new Coton owner who has been successful with crating her Coton. I think my fear of not coming back home in a reasonable amount of time to let him out of the crate will traumatize my dog, and is probably why I have not been successful with crating my dog. I am so blessed and grateful that my dog is so loving and forgiving. I grew up with and raised my kids with "outdoor" dogs, and never fully experienced caring for a companion or lap dog. (exception, another story about "Ziggy" the Pomeranian another time). Tuffy has separation anxiety because he was so young (barely six weeks old) when I got him. Coming from a breeder with a house full of small children and dogs Tuffy went to almost instant companionship deprivation. I did take a few days off work to bond with him and had a wheelchair accessible bathroom, large enough to be a large kennel. I had set up food and water near the open door with a see through gate, a potty paper at the opposite end of the room, a toy basket with toys and an open door crate. There was plenty of room for him to run around in there and light and air with the open door. The breeder assured me he would be fine in an apartment. I believed he was doing well. I took him out and played with him every night and walked him on weekends when I was off work. My neighbors never complained, and only on the day I was moving out (four months later) did my next door neighbor confess that the puppy carried on crying incessantly. My heart sank. I hope anyone who is thinking of getting a Coton, or any other puppy will realize these dear social animals are like human babies, and will suffer from deprivation if they are left alone without loving comfort and attention. They are not "just dogs", they are living breathing loving beings. If I had know better at the time I may have either reconsidered getting a dog, and or first recruit some day care help before getting a dog. Tuffy and I now live in a house with family and I do not have a job to go to, just spending all my time with him, we go for several walks a day (if the weather permits), or else romping and playing in the house. I have often thought Tuffy needs a playmate and we would probably both benefit from it, but being on a low income I cannot afford another pet. This one uses up a grand portion of my income. With license fees,immunizations,Vet fees and monthly flea & *tick preventive applications *we live in Lyme tick territory, Tuffy had a severely painful case of Lyme disease a couple of years ago) and I also give him preventive heartworm medication, At one point Gale had a survey for Coton owners which I did participate in, and thought about yesterday (I think I spend a great deal more than I thought at the time) when I stocked up on Tuffy's favorite treats and Narural Balance lamb roll an addition to his dry food (IAMS). The store had a two for one sale on Pure Bites, my dog's favorite is the freeze dried liver bites. I put them in his kong toy and sometimes tie it up in a sock(he is good at untying knots, he loves the challenge!) to keep him busy and use it to reinforce training. I still give him half a Dogswell Mellow Mut chicken strip after our very early morning outing, more for me than him, because it calms him when he is ready to play and I am ready for more rest. Tup, this is one very finiky and pampered pup. He prefers only natural food, no coloring or junk food for dogs. Any cheap stuff I buy ends up in the shelter donation box at the feed store. If you had a contest for the most pampered pooch Coton, Tuffy would have to win hands down! I LOVE HIM! I think I might have made the crate training sound too easy in my comments about Casper- it was a process, but ultimately successful. He did cry and cry at 1st- so I trained while I was at home. He went in the crate for an hour (and I just turned up the TV while he cried). After an hour he got out and had a treat and some playtime. In just a couple of days he stopped crying. Then I upped it to two hours etc.... I came home on my lunch breaks for awhile until I felt his little puppy bladder could hold it all day. He sees his crate (we call it his bed) as his place to get away when the house gets noisy or we have lots of company. We went to obedience classes that were WONDERFUL and one of the things they taught us was that having a dog that feels independent of you (not always needing to be near you or have you playing with them) is important- both for your sanity and the dogs happiness. I think this is especially hard for Cotons (or maybe just Casper!) In any case- we are still working on that. YES- I think our dogs look so much alike- I got Casper from a breeder in Ohio- you? Yes, Tuffy is one well loved dog. Thanks for sharing your experience. I guess I feel grateful that Luc never really had major issues with separation anxiety even though I work outside the home full time (except in the very beginning which we worked thru).